Linking Lower Marsh to the South Bank, Leake Street – also known as the iconic ‘graffiti tunnel’ – was brought to fame by infamous street artist Banksy, and is now one of London’s most popular urban street art locations. Being one of the few walls in the UK that artists can legally express their art on, it is the prime location for graffiti artists worldwide to leave their mark. 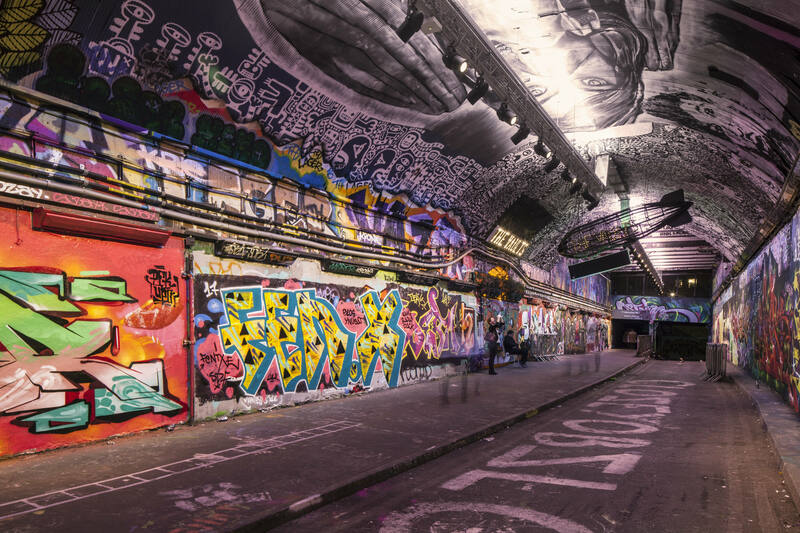 Recently, cutting-edge lighting design consultancy Nulty completed their work on the regeneration of Leake Street Arches, including lighting 300m of the dramatic street art. Working closely with developers LCR, the company’s main objective was to celebrate the artwork, emphasising and rejoicing in the creativity decorated along the tunnel walls. Another part of the brief was, naturally, to improve the quality of the light throughout the space. Nulty’s concept brings the tunnel to life through their innovative use of light, making it work both as a canvas for the artwork to be displayed on as well as a ‘gallery’ of sorts for passing visitors. Three things were essential during the project’s development: the space had to remain flexible for future events; the light scheme had to showcase the unique artwork; and from a structural perspective, the robustness and durability of the light fittings was vital. Bespoke spotlights with secondary glass lens make for a theatrical appearance, and the lens can be removed easily and cleaned if it is accidently spray-painted. 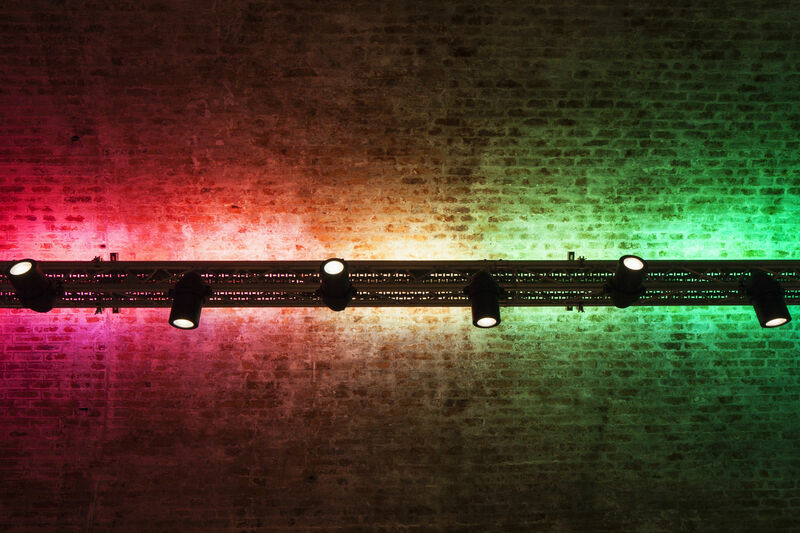 Uplights in red, green, blue and white illuminate the tunnel ceiling and have colour changing abilities; these can be tailored to the mood of different events taking place in the tunnel. Light fixtures mounted at the base of the arches provide accent lighting and highlight the curved architecture of the space. To make sure the fixtures could withstand wear and tear in the tunnel, Nulty worked closely with Secure by Design. As the Nulty offices are beside Waterloo Station, the project was right on the design consultancy’s doorstep. “It was fantastic to have the opportunity to collaborate with our local community and be part of the development of an urban space that our team know, love and use on a daily basis,” said Nulty Director Ellie Coombs. 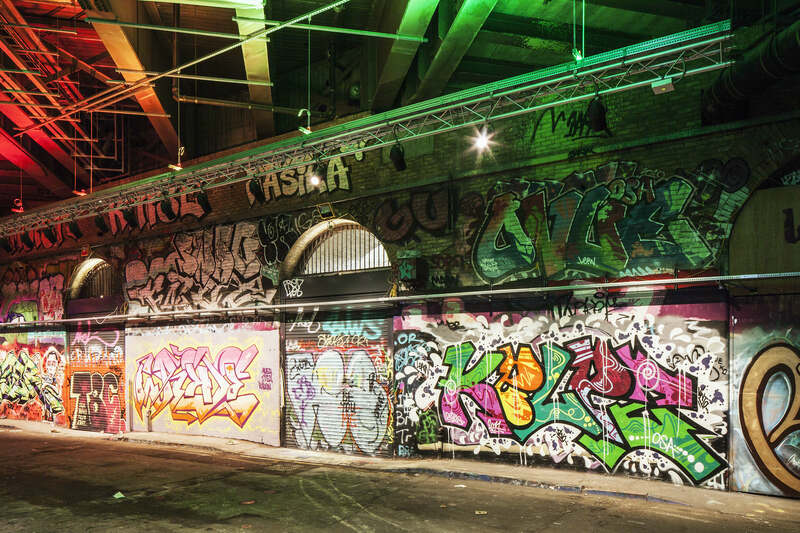 The redevelopment of the Leake Street Arches encompasses eight former railway arches next to the Graffiti Tunnel, and strives to capture the spirit of urban culture through a selection of independent restaurants and bars. Already an extraordinary sight - and a destination for the millions of people who visit the South Bank each year – Nulty has ensured that that the Graffiti Tunnel is spectacularly illuminated, and can be seen in all its glory.